Whether you are looking to find the best HID color for your car's headlights or simply looking to learn how HID colors work, you've come to the right place. For those that are not familiar with how HIDs work in the first place, High-Intensity Discharge (HID) bulbs create light by heating a special gas and metal mixture contained within the bulb. The temperature at which the gas inside the HID bulb is heated determines the color of the light emitted ranging from red to white to purple. When looking to upgrade your headlights (or fog lights) from halogen to xenon HIDs, you will need to choose the color of the bulbs. 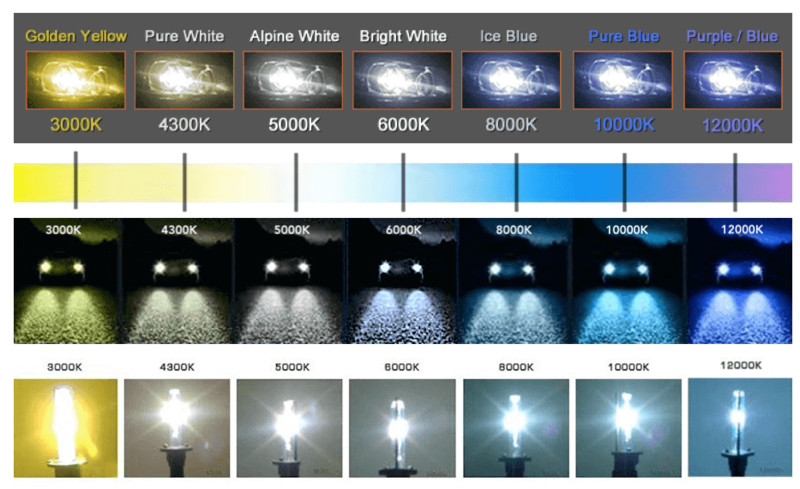 Our comprehensive HID color guide will make sure you pick the perfect color lights for your car and needs. HID bulbs come in a variety of colors ranging from yellows (3000K – 4300K) to whites (5000K – 6000K) to blues and purples (8000K and over). The best way to decide which color/temperature you should choose for your HID bulbs is by looking at our HID color chart. The brightest HID bulb color can be found in the lower-middle end of the spectrum sporting a primarily white color (4300K – 6000K). What is the brightest HID color temperature? The brightest HID color temperature is 5000K, emitting perfectly white light. 4300K and 6000K will be just as bright but will have a very light tint of yellow (4300K) or blue (6000K). Most people shopping for HIDs believe that a higher bulb temperature will yield a brighter light but this is in fact not true. As the bulb color temperature increases to reach blue and purple levels, the light output will be inferior to regular halogen lights. What is the best HID color temperature? Most people looking to upgrade their headlights to HIDs from halogens are doing so with the intention of improving visibility on the road, in which case the best HID color would be 4300K, 5000K or 6000K. It’s important to note that stylish lights (8000K and above) are the least bright and may, in fact, emit less light than your stock halogens. If you want the perfect balance between brightness and style, we recommend going with 6000K, which are very bright and have a nice blue tint. If you want a good balance between brightness and original lighting color, we recommend going with 4300K. The xenon HID color temperature scale is particular in that it features the brightest colors right in the middle of the scale while beginning and ending with dark and less bright colors. It is important to know that an HID bulb color is commonly expressed as a bulb temperature (example: Bright White = 5000K), which is measured in Kelvins (“K”). Kelvin is an absolute color temperature scale that can also be approximated in lumens, which is a common measure of light output/brightness. As a rule of thumb, bulbs with a higher color temperature produce a lower light output compared to lower temperature bulbs as summarized below. There is a common misconception that a higher temperature bulb will emit a brighter light output, but this is in fact very wrong. The optimal HID color temperature for ultimate brightness stands right in the middle of the scale at 5000K or 6000K. Although 3000K (golden yellow) and 4300K (yellow-white) have a higher light output (~3,200 lm) compared to the whites (~3,000 lm), the human eye can see better and more clearly in a white light comparable to natural sunlight. The higher light output of 3000K HIDs also explains why they are most commonly used in and recommend for fog lights. The light output can be improved by almost two folds up to 8,000 lm by using a more powerful ballasts, such as the upgraded 55-watt HID conversion kit by XenonPro. HID bulbs with a color temperature of 3000K produce a golden yellow light that most resembles halogen bulbs and fog lights. This bulb temperature is recommended for those that want to increase the light output from their headlamps/fog lights while maintaining the same color as their stock halogen bulbs. 4300K bulbs produce white light with a hue of yellow comparable to natural lighting. This bulb color is perfect for drivers who wish to dramatically increase nighttime visibility without drastically changing their stock lighting color. 5000K is the ultimate bright white light found right in the middle of the color temperature spectrum. This bulb will unquestionably produce the purest white color and is perfect to dramatically improve nighttime visibility. Your lights will look like those of new luxury vehicles such as BMWs and Audis and will be most similar to LED headlights. With a tint of blue, 6000K alpine white bulbs will not only give you very bright lights similar to the 5000K but will also give you a stylish blue hue. If you’re considering blue or purple lights, you should be ready to compromise on brightness because these are for aesthetics. These bulbs emit a powerful light-blue beam, which will only be marginally brighter than your stock halogens but will definitely look good. Like the 8000K, the pure blue 10000k bulbs are for looks only. These will emit a much darker blue compared to the 8000K and will be even less bright. At this level of the color temperature color spectrum, the light emission drops dramatically as explained above. Reaching the end of the color temperature spectrum we get a purple light color. These lights are very stylish and unique but unfortunately product the same light output as stock halogen bulbs and potentially even less. Blue and purple HID headlight bulbs are very popular despite not being a great source of light. Drivers and car enthusiast like to get these for the Fast and the Furious appeal. If you are looking to upgrade your fog lights to HIDs it is best to go with a golden yellow (3000K) or yellow-white (4300K). We strongly recommend against using blue or purple bulbs (anything 6000K) for your safety in times of poor visibility (fog, haze, rain, snow, etc. ).